1. What type of hierarchy currently exists among personal beings? a. Angelic spirit personal beings, God, Human personal beings. b. Angelic spirit personal beings, Human personal beings, Holy Spirit. c. God and Holy Spirit, Angelic spirit personal beings, Human personal beings. d. God incarnate, Angelic spirit personal beings, Human personal beings. 2. What type of hierarchy will exist when Christ returns? a. Angelic spirit personal beings, Divine personal beings (Triune God), Glorified Human personal beings. b. Angelic spirit personal beings, Glorified Human personal beings, Divine personal beings. c. Divine personal beings, Angelic spirit personal beings, Glorified Human personal beings. d. Divine personal beings, Glorified Human personal beings, Angelic spirit personal beings. 3. 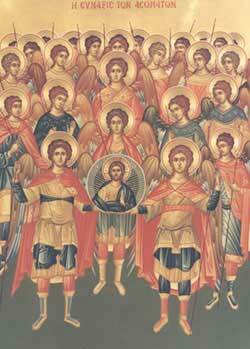 Is there a hierarchy among angels?